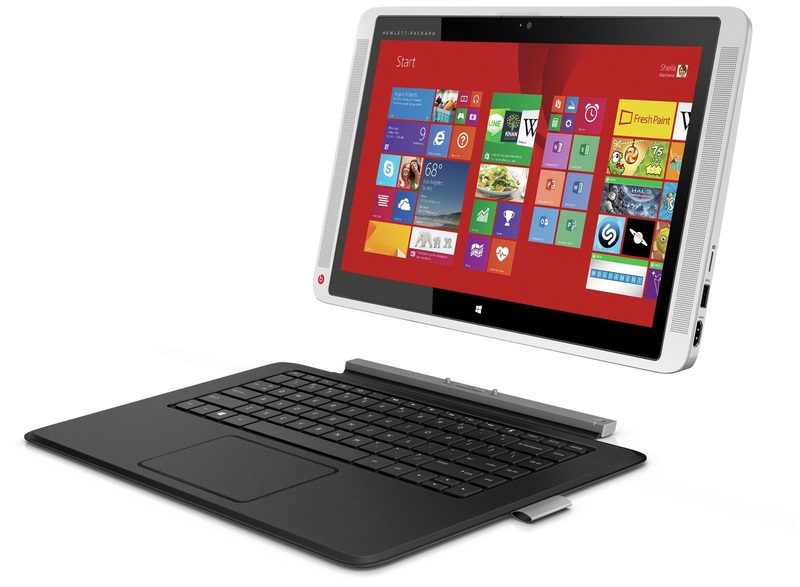 HP presents its new ENVY 13-j001ng x2 convertible. The manufacturer sees it as a flexible, elegant, and always ready for use all-rounder. Intel's new Core M chip that clocks with 1.1 GHz alongside the integrated Intel HD Graphics 5300 graphics solution should ensure that. The review sample additionally features 8 GB of working memory and a 256 GB SSD storage device, which is to prevent long waiting times. A high-quality, Full HD, IPS screen provides the necessary clear view. The total package is rounded off with Beats Audio components. HP demands a price of approximately 1000 Euros (~$1253) for this bundle when everything is added up. As usual, we let the review sample compete against a few rivals. One is Toshiba's Satellite Click 2 Pro that is a worthy contender with a 1.7 GHz Haswell CPU (Intel Core i5-4210U), a 256 GB storage capacity and an IPS screen. We will examine whether the Satellite's additional 100 Euros (~$125) is justified in the test. 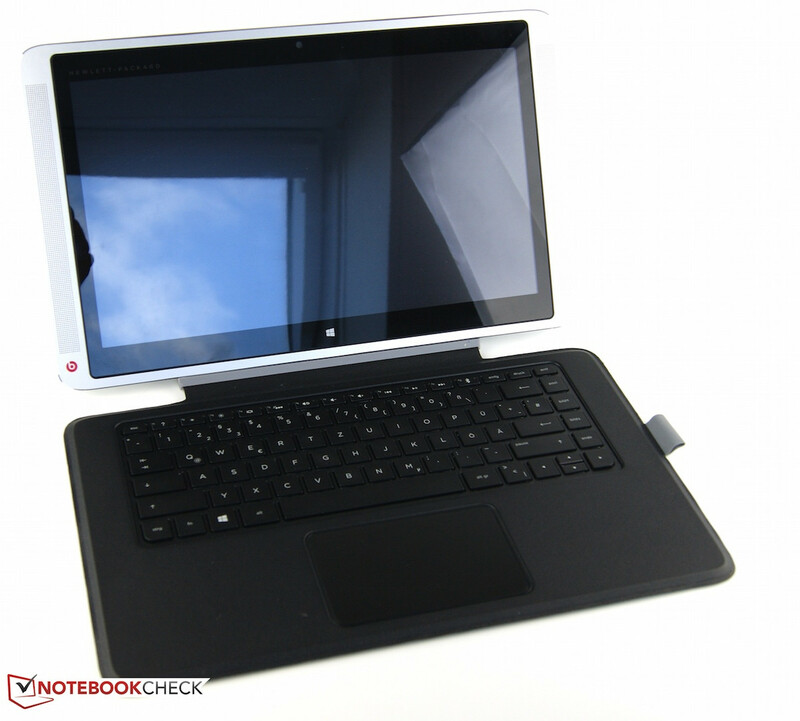 This looks absolutely different for Asus' Transformer Book T300LA. It comes with an Intel Core i5-4200U, 128 GB storage, as well as an IPS screen for 100 Euros (~$125) less. The casing of the Envy x2 consists of two parts. 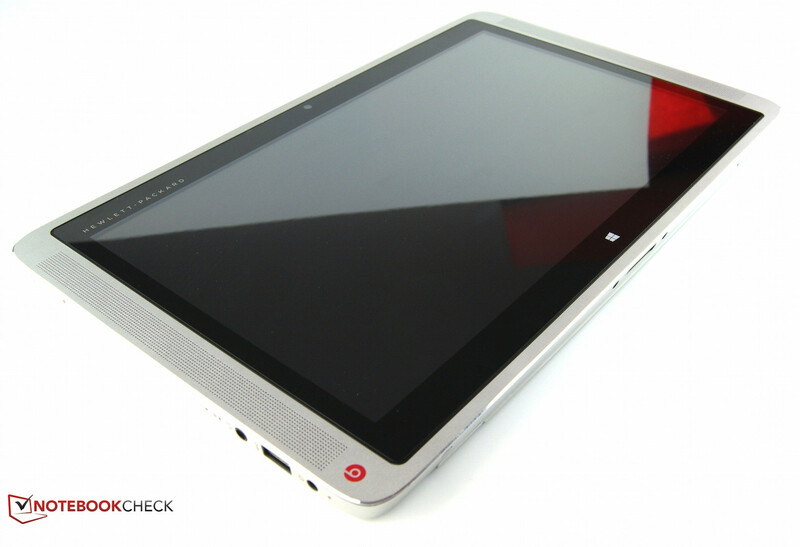 The tablet features a casing of noble aluminum and some plastic elements. The screen and its black plastic bezel are encircled by a metal frame. The speakers, including printed Beats Audio logo, are on the left and right. The device's front is adorned with a chrome-colored bezel. Not only its looks are appealing, but also its feel. The maximum height of 1.4 cm in the screen's lower area makes the convertible particularly thin. The device undercuts its contenders even when the keyboard is connected, with 1.9 cm. The casing nevertheless makes a robust impression and is a lightweight with 1266 grams (1796 grams w/ keyboard) compared with the comparison devices. Two different textile parts cover the keyboard. The underside shows a dotted gray and white pattern. In contrast to that, an elegant and soft leather look is on the upper side. However, it is not as favorable that the edges are only made of loose material strips that also protrude when the device is closed. To stick to the topic of build, one key in the keyboard of our review sample was strikingly loose. Otherwise, the tablet's build is very satisfactory. A loop for a digitizer has additionally been sewn onto the keyboard unit's right. 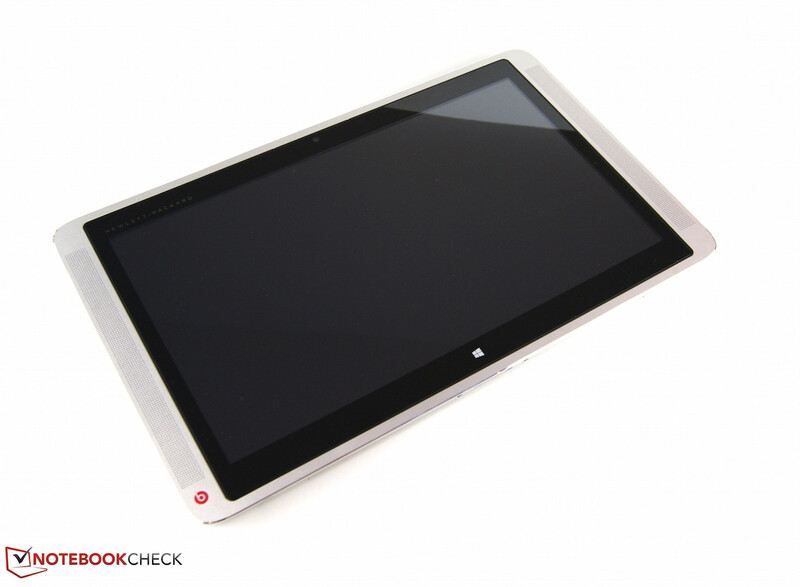 All interfaces of the Envy x2 are installed in the tablet unit. They have been conveniently placed in the lower area (erected). One USB 3.0 port is found on both sides. Connecting a bigger USB stick and an HDMI cord simultaneously could cause problems. A magnet connection for the keyboard unit is on the lower edge. The keyboard's power button has been placed somewhat disadvantageously. It is located right by the connector and can thus only be operated before use. 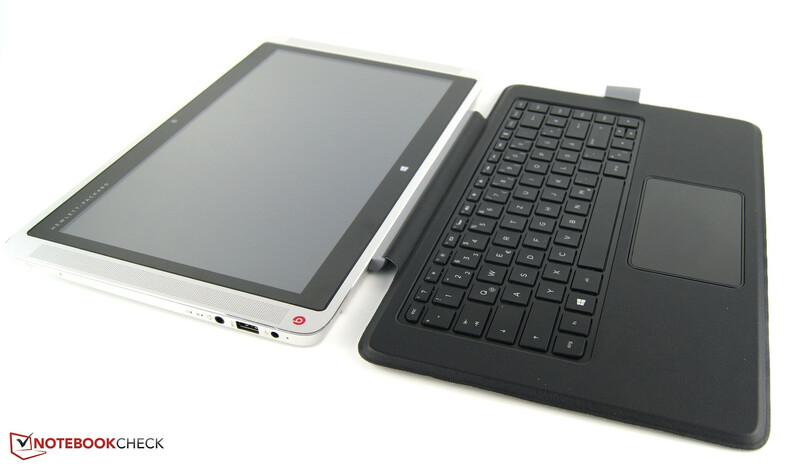 The textile soft combination of keyboard and tablet unit exclusively allows using the tablet mode on the lap. The installed network adapter is Intel's 7265NGW module. Data can be transferred with up to 104 Mbps. To test the throughput rate in everyday life, we used a non-standardized test in the author's setup to ascertain the average download speed. The test was set up one story below the router, and an Apple MacBook Pro Retina 13 (late 2013) was used for comparison. 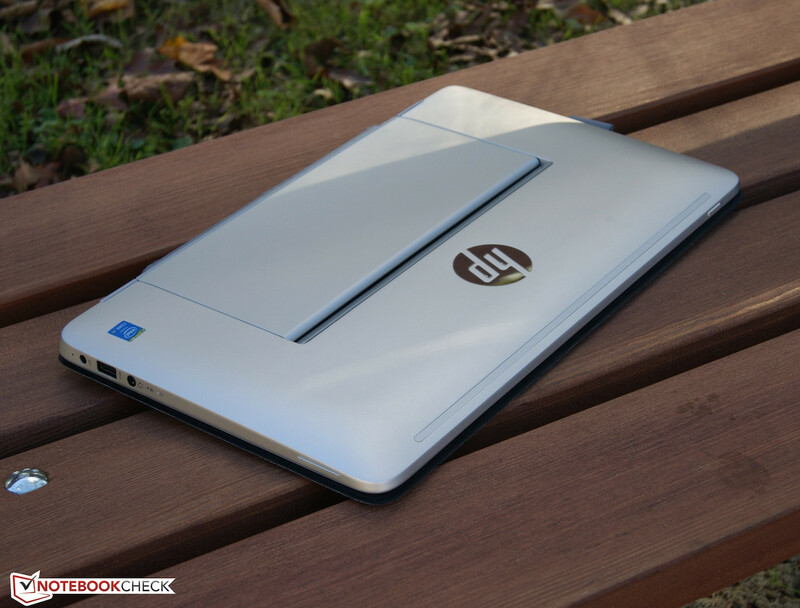 HP's Envy x2 achieved an average of 2.9 Mbps. The MacBook is considerably faster with 7 Mbps. Both contenders reached the same speeds when we moved the test to the same story as the router. Videos shot with the Full HD camera run smoothly, but they exhibit slight color deviations and evident noise. It should nevertheless suffice for video chats. No accessories were included for the review sample apart from a few brochures. A mouse (50 Euros, ~$62) and additional Bluetooth speakers (130 Euros, ~$163) are offered on the official Envy 13 website. 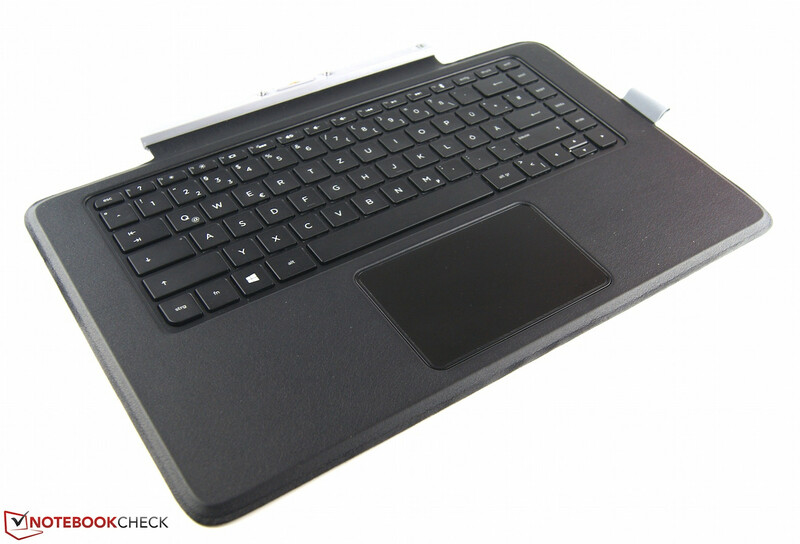 The digitizer loop on the keyboard unit is meant for HP's Executive Tablet Pen G2 (53 Euros, ~$66) that can be used for handwritten notes as well as a mouse replacement. According to HP, product details will be available late December. The tablet is not meant to be maintained by the user. Openings or maintenance covers are not provided. Only skilled hands should thus attempt disassembling HP's Envy x2. HP states a 2-year limited warranty on parts. Users can upgrade this warranty with HP's Care Packs. For example, a pick-up service for three rather than two years is offered, as well as partial co-payment in case of drop damages and spill protection. With 200 Euros (~$250), a fifth of the purchase price has to be invested for that, though. The classic basic warranty upgrade by a year with extended technical support is available for just below 118 Euros (~$148). 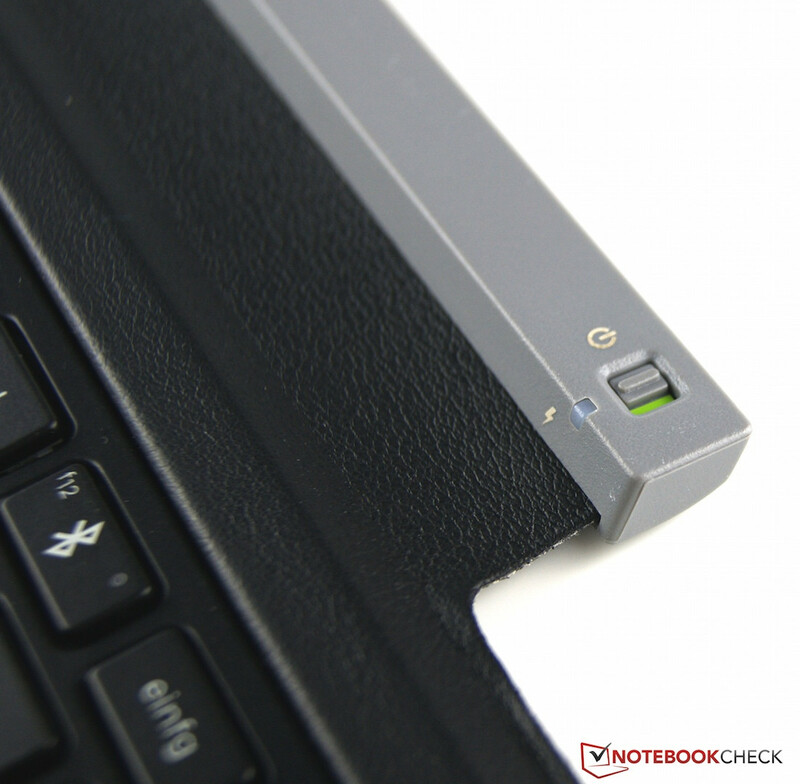 The black chiclet keyboard's keys feature a soft and short drop, which allowed typing especially quietly on the review sample. It is notable that a single-level backlight is installed in this external input device. It was possible to type smoothly and quickly on the keyboard. As mentioned, one key was loose in our case and buyers should check this right after purchasing. 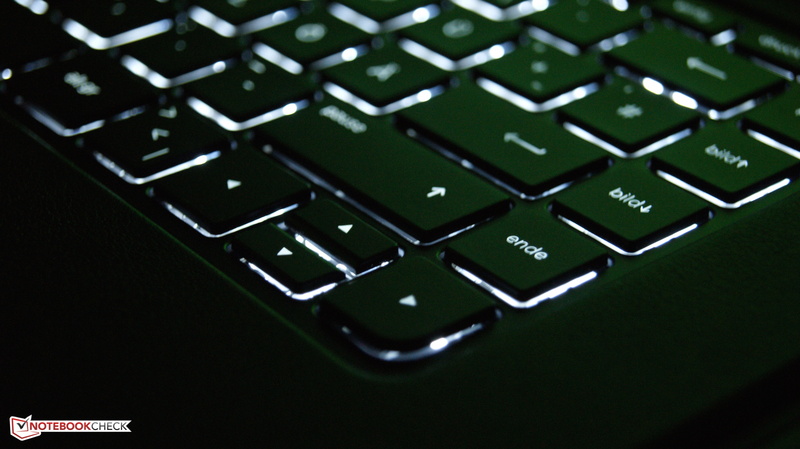 The up and down arrow keys still need getting used because they share the space of one key. 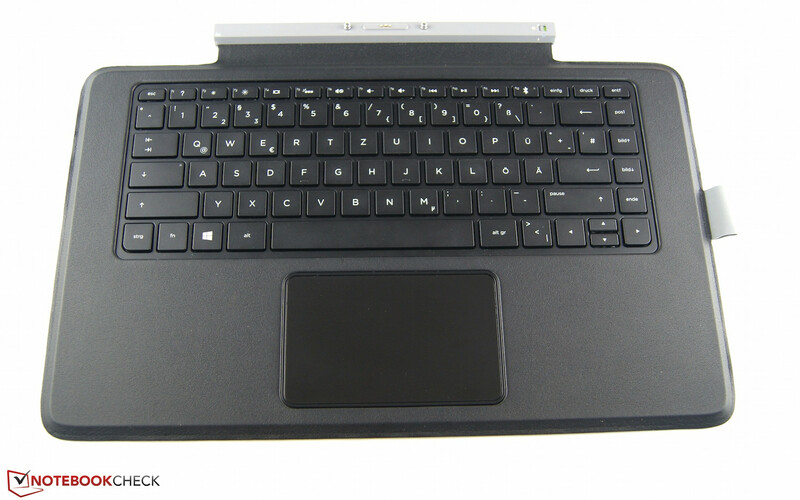 The keyboard of HP's Envy x2 can be called as very feasible in total. The touchpad's size of 11 x 6.7 cm is pleasing. Navigating is quick and accurate owing to the suave surface. Unfortunately, we noticed that slow gestures on the pad often led to a jerky mouse cursor on the screen during our tests. However, multi-touch gestures like scrolling websites were detected impeccably. A brochure with all possible gesture patterns is included for the device. Two buttons with quiet click noises and a short drop are installed in the lower area. Using an external device is recommendable for longer work periods because the occasional slight delays in response that we observed were annoying. Inputs made on the 10-finger touchscreen were implemented smoothly and immediately during our test. All inputs and gestures were detected without problems up into the corners. 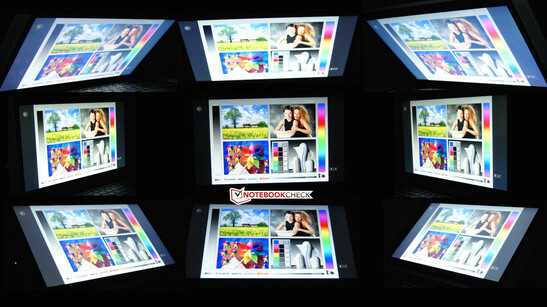 Images are rendered on a Samsung IPS screen in 1920x1080 pixels. The glare surface has an impressive average brightness of 368.3 cd/m² that the contenders cannot provide. 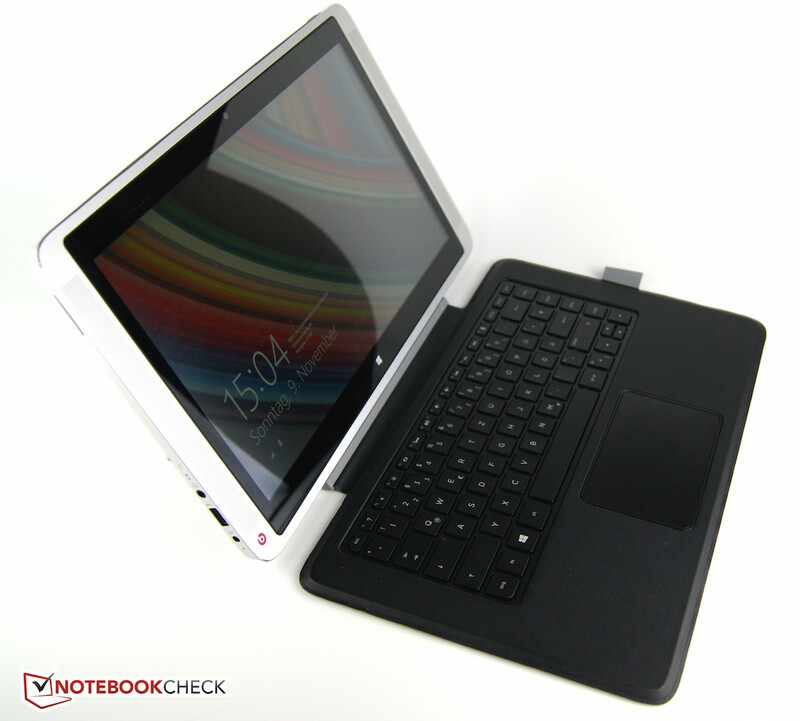 Asus' Transformer Book T300LA has a brightness of just 220.4 cd/m². 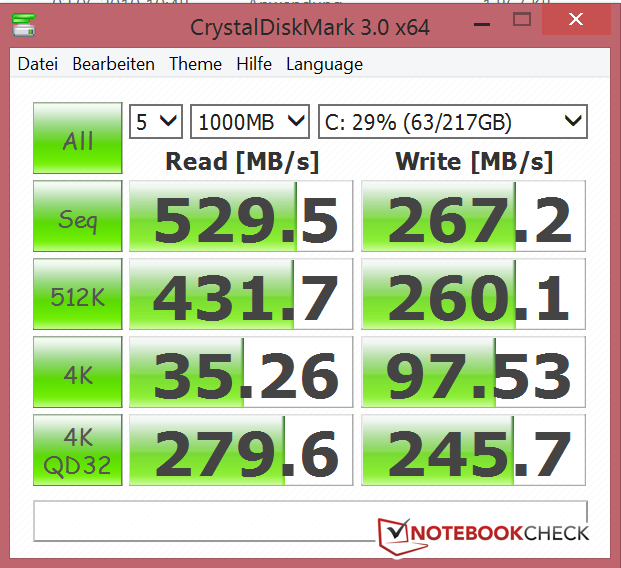 Toshiba's Satellite Click 2 Pro is somewhat better though not quite on the review sample's level with 304.8 cd/m². The screen's build results in a pleasing image reproduction. Nevertheless, reflections might become distracting when positioning the device unfavorably to external light sources. Another problem of our screen is noticed at the edges - clouding. White spots are clearly visible on black backgrounds. A color temperature of 6500 K is considered ideal. We measured 6583 K in the center of the convertible's screen, which is just slightly above the ideal rate. The contrast of 919:1 is just as impressive and is pleasing in movies. Although the contenders lag behind here, they are not bad either (Toshiba Satellite Click 2 Pro: 819:1 and Asus Transformer Book T300LA: 848:1). The resulting black level of 0.42 cd/m² is quite high due to the bright screen. The contenders' lower brightness leads to better rates. A high DeltaE shift of 8.05 was ascertained in the analysis of the grayscale reproduction. It looks a bit better in the colors with a dE rate of 5.49. Toshiba's Satellite Click 2 Pro displayed a shift of less than three in both tests, and it can thus reproduce colors in the sRGB color-space comparison particularly accurately. The screen's high brightness makes outdoor use possible despite the reflective surface. The content can still be seen well especially in shade-protected surroundings. However, direct light sources behind the user, such as sunlight, thwart this undertaking. Since the comparison devices do not feature matte screens either and even have lower brightness, HP's device is the most suitable one for this scenario. Colors and brightness barely deviate when the screen is tilted owing to the IPS technology. It is possible to use it in virtually every imaginable position - in both tablet and laptop mode. The Envy x2 is to be in no way inferior to a conventional laptop. 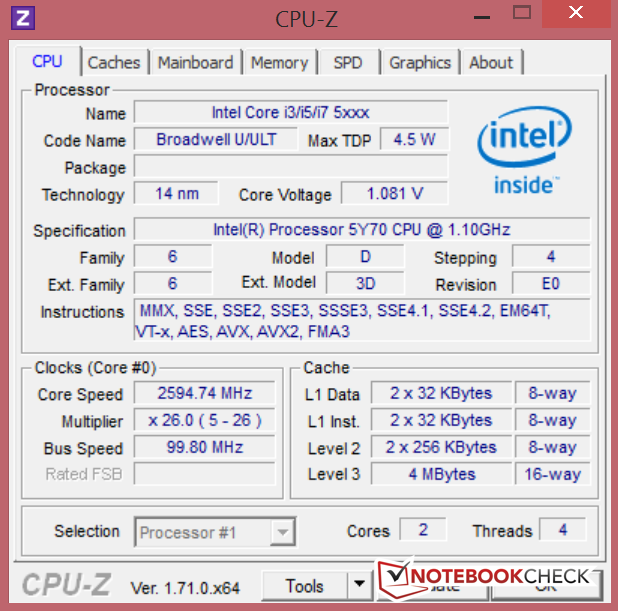 Intel's new Core M-5Y70 (Broadwell) processor with a base clock of 1.1 GHz, which can increase its clock to 2.6 GHz via Turbo mode, should ensure that. The 8 GB of working memory operates in dual-channel mode. In conjunction with the swift 256 GB storage device and Intel's HD Graphics 5300, the Envy x2 might just turn out to be a real all-rounder. 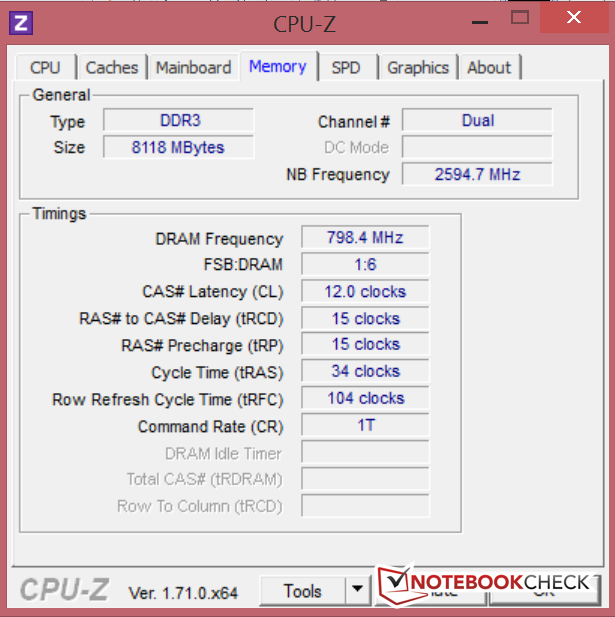 Intel's Core M-5Y70 has a base clock of 1.1 GHz, which can be boosted up to 2.6 GHz for short moments via Turbo mode. Thus, the processor has an unusually large margin. Cinebench R15 will illustrate in which league the new CPU line plays. The multi-core score of 182 points is considerably lower than that of the contenders. Asus' Transformer Book T300LA (i5-4200U) manages a lead of 18%, and Toshiba's Satellite Click 2 Pro (i5-4210U) also scores much higher with 31% more points. The performance range of Intel's Core M-5Y70 is located between Intel's Core i3-4010U and Intel's Core i3-4030. However, the lower TDP of 4.5 watts has to be considered to justify this outcome in relation to the contenders. That is less than a third of the contender's power consumption (Intel i5 Haswell U: 15 watts). Then again, it looks completely different when compared with the more economic Intel i5-5202Y (Haswell, 11:5 watts) found, for example, in HP's Spectre 13 and HP's Pro X2 G1. The new Intel Core M-5Y70 is roughly on par and tends to be even marginally faster in the multi-thread rendering test. A considerable performance boost is achieved in the single-thread rendering test - with the CPU's TDP more than halved mind you - which consequently allows a fan-less design! Throttling (i.e. undercutting the base rate) was no issue during the tests. The maximum Turbo rate was, however, not permanent. The average clock was 1.5 GHz after several test runs. The full performance is only available in AC mode and drops by 7 - 8% in battery mode. Owing to the strong hardware components, we did not experience any long waiting times while working on our review sample during the tests. PCMark 8 confirms this subjective impression. Though the contenders are right at the Envy x2's heels, they lag behind it - despite higher-performance Intel Haswell U processors. The convertible makes use of a 256 GB Samsung solid state drive to ensure swifter response times. Sequential read rates of almost 530 Mbps outclass the contenders. 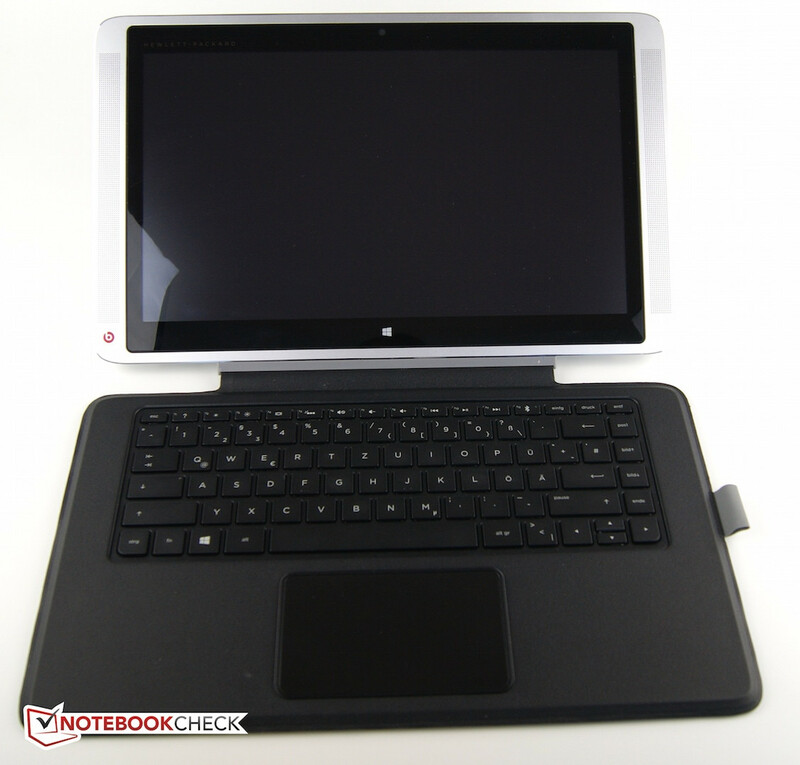 However, Toshiba's Satellite Click 2 Pro defeats HP's Envy 13 x2 by over 200 Mbps in the write rates. The review sample convinces in the crucial 4K results, in return. The used graphics solution is based on the selected CPU here because Intel's HD Graphics 5300 is directly integrated into the Intel Core M-5Y70. Its preferred application scenarios are basic office and multimedia tasks. A look at the 731 points achieved in 3DMark 11 helps to classify the performance. Both contenders feature an Intel HD Graphics 4400, but with different core clocks. The Transformer Book T300LA is behind our convertible by almost 30 points, but Asus' laptop accomplishes approximately 40 points more. The Intel HD 4200 GPU in the Spectre 13 is within a similar range. We can again speak of an amazing performance of Intel's CPU/GPU seeing that it reaches the level of the HD 4400 despite the CPU's significantly lower cooling load (TDP). Significant performances losses do not need to be feared in battery mode. 3DMark 11 achieved very similar results. The previous 3DMark scores do not allow an unambiguous classification of the gaming performance. The buyer should be aware that the limits in gaming will soon be reached due to the installed energy-saving CPU. However, users who can live with a lower graphics quality level can enjoy some up-to-date games like Tomb Raider or BioShock: Infinite from 2013. Even F1 2014 from this year ran smoothly with an average of 33 fps in lowest settings. However, the review sample's power was not enough for Alien Isolation. In total, the level of an Intel HD Graphics 4400 could be reached in the games we tested. We would refer to our article "Computer Games on Laptop Graphic Cards" for more results. The convertible is absolutely silent owing to its fan-less design. A fan is installed in the contenders, and thus Toshiba's Satellite Click 2 Pro, for example, is very audible with a maximum of 38 dB(A). 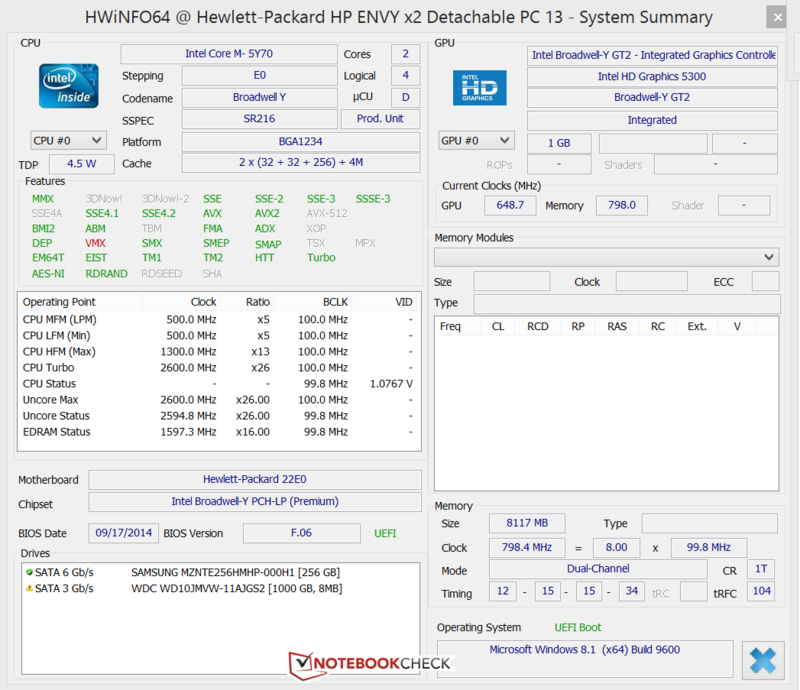 While HP's Envy 13 x2 operates without a notable heat development in idle mode, the fan-less design takes its toll in load. However, the hot spot of 43.5 °C is not yet close to the pain barrier and is only slightly unpleasant when this area is directly on the skin for a longer time. 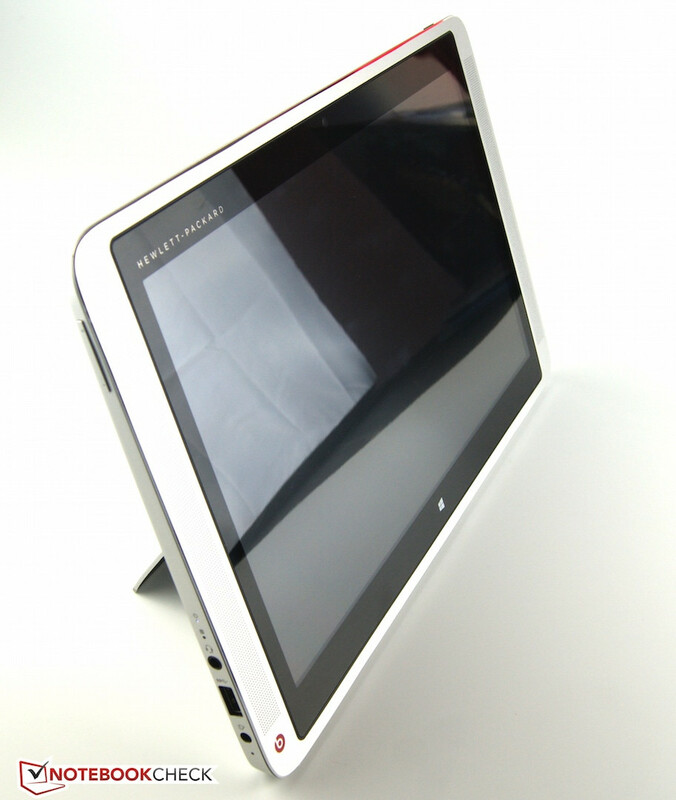 Despite its loud fan, Toshiba's Satellite Click 2 Pro has comparable temperatures of up to 47.2 °C. 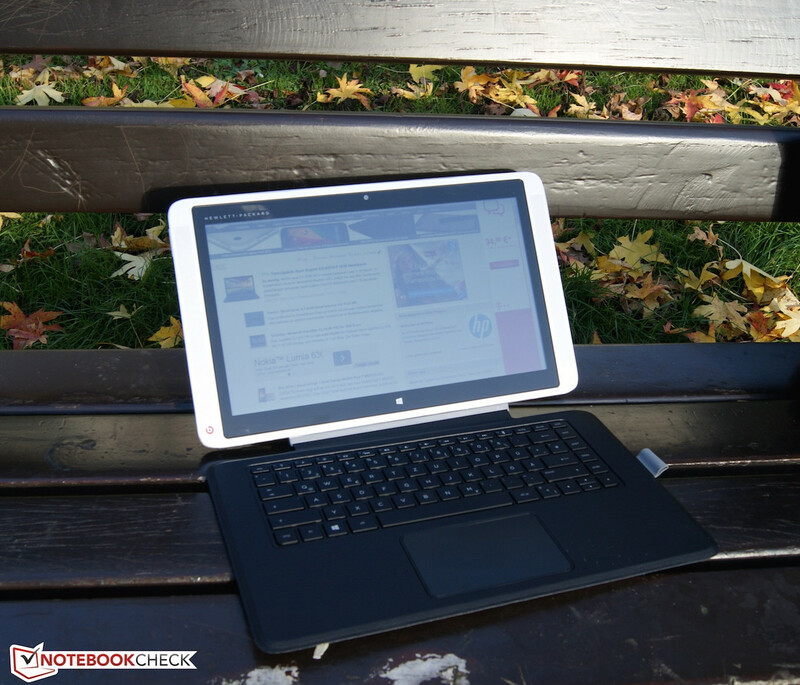 Asus' Transformer Book T300LA only remains cooler by three degrees than our review sample. The CPU's clock frequency dropped to 800 MHz right after we started the stress test, which is below the base clock. The CPU's temperature settled to approximately 67 °C and the clock frequency was 700 MHz over the entire testing period. 3DMark 11 still achieved 731 points after the stress test finished, which is in the normal range of the tests. (±) The maximum temperature on the upper side is 42.9 °C / 109 F, compared to the average of 35.4 °C / 96 F, ranging from 21.8 to 55.7 °C for the class Convertible. (+) In idle usage, the average temperature for the upper side is 26.5 °C / 80 F, compared to the device average of 30.3 °C / 87 F.
(-) The average temperature of the palmrest area of similar devices was 29 °C / 84.2 F (-13.9 °C / -25 F). Expectations on the sound of convertibles and especially tablets are not very high. Thus, it is all the more pleasing when there is a positive surprise like with the Envy x2. Owing to Beats Audio, the sound spectrum can truly be called worthy of listening to. The speakers directly face the user, which additionally contributes to the sound reproduction. The volume is also more than sufficient for a cozy meet-up and movie night. 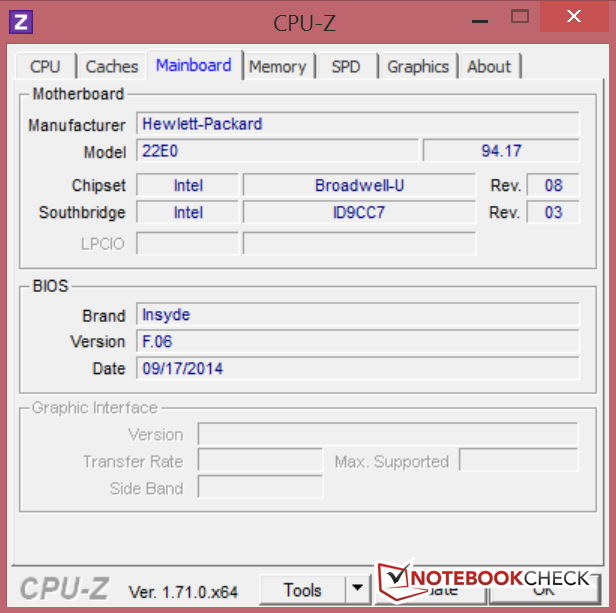 Consequences of the new Broadwell CPU can be ascertained in the power consumption. The device's consumption ranges from 3 - 7.9 watts in idle (balanced profile, communication modules off). 18.2 watts is required when the battery is recharged. Differences between the comparison devices and review sample are also seen in load operation, where the Envy x2 is considerably more frugal. 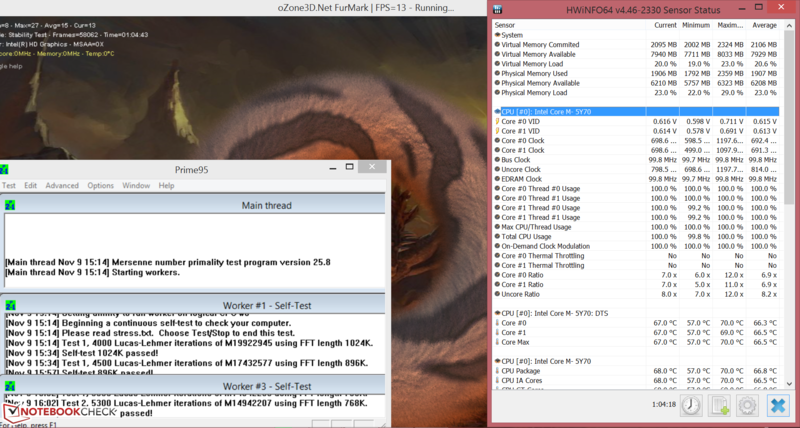 A similar level as the Haswell Y models is reached in load mix. However, our device with a 5Y70 CPU has the lead in full load, which is due to the considerably higher Turbo. The 45-watt power supply will be able to cope easily with the review sample's power consumption in any event. 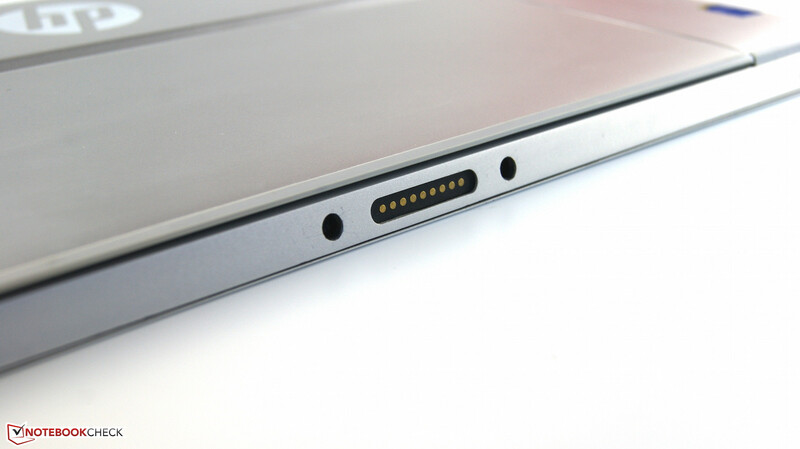 Two cells and 33 Wh should suffice as the battery in HP's convertible. Texts could be read for roughly 12 hours when the communication modules were off and in minimum brightness. Browsing through websites with a brightness of approximately 150 cd/m² is simulated in the most relevant test scenario. The review sample shut down after 5 hours and 23 minutes. Asus' Transformer Book T300LA lasts over twice as long. We ascertain the minimum battery life using Battery Eater's Classic test. Owing to the economic Broadwell architecture, the Envy x2 achieved 2 hours and 41 minutes. Even the Transformer Book is drained 10 minutes sooner. 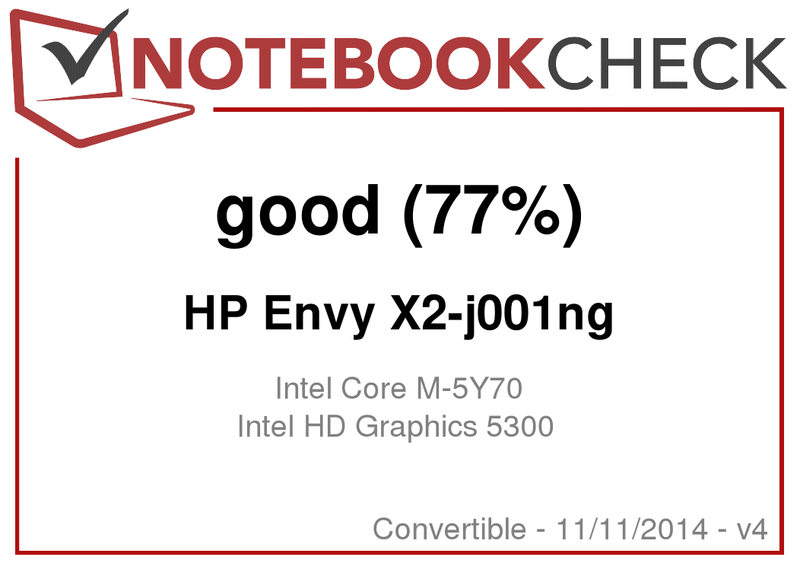 HP's Envy x2 achieved solid results over the entire test period. The robust metal casing provides elegant looks. Mechanical inputs can be performed using a keyboard unit connected via magnets. Typing is comfortable and easy and the touchpad scores with its big and suave surface. However, the mouse cursor occasionally jerked when making inputs on it. A bright and stable viewing-angle screen belongs to the mobility of a convertible. The high average brightness of almost 370 cd/m² is also an advantage. The innards also excel with a good system performance that outclasses the level of current Haswell Y processors. The Envy x2 pulls the ace out of its sleeve in noise and proves to be absolutely silent owing to its SSD and fan-less design. This does not have a big impact on heat development in comparison with its contenders. Since tablets are especially interesting for mobile use, special focus is placed on battery life. A runtime of 5 - 6 hours can be reckoned with in real-world browsing use. 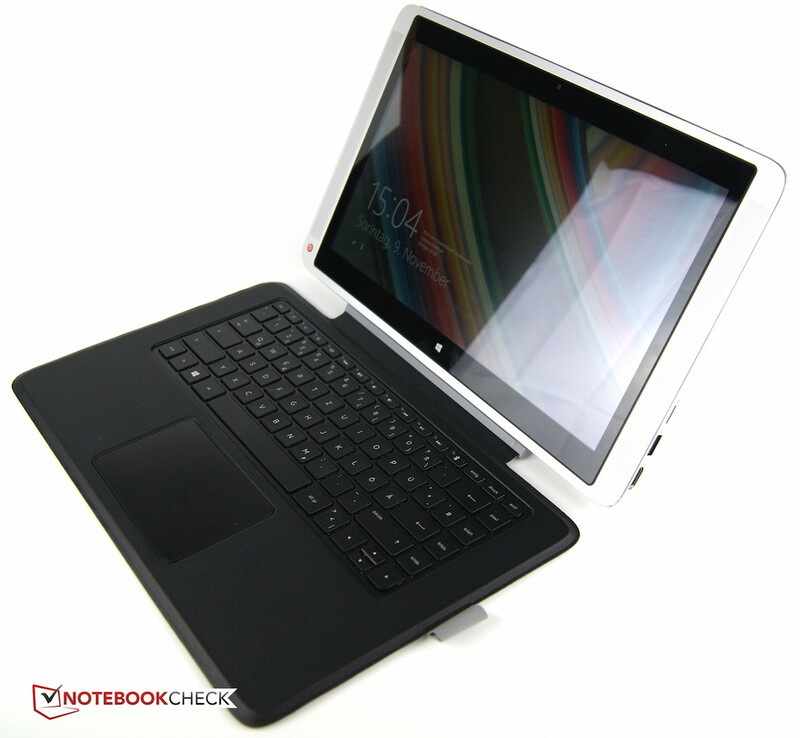 Asus' Transformer Book T300LA provides more mobility. 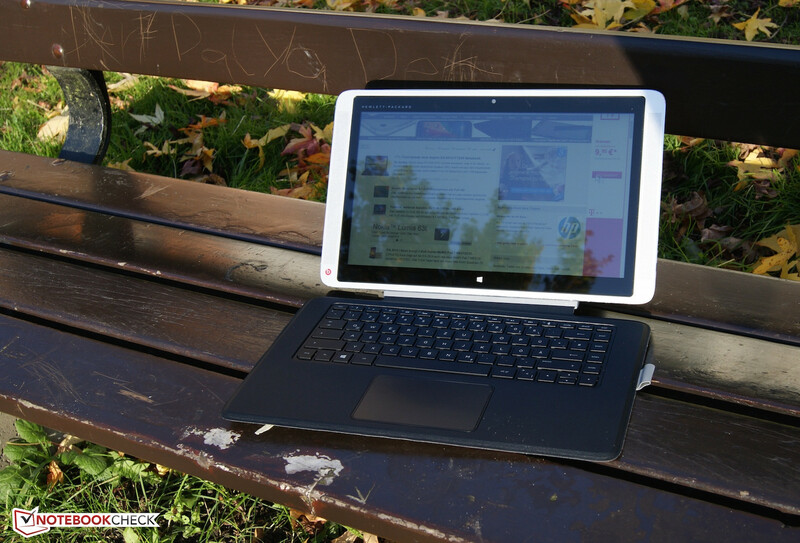 In a nutshell, we can say that the concept of HP's Envy x2 is well-conceived. 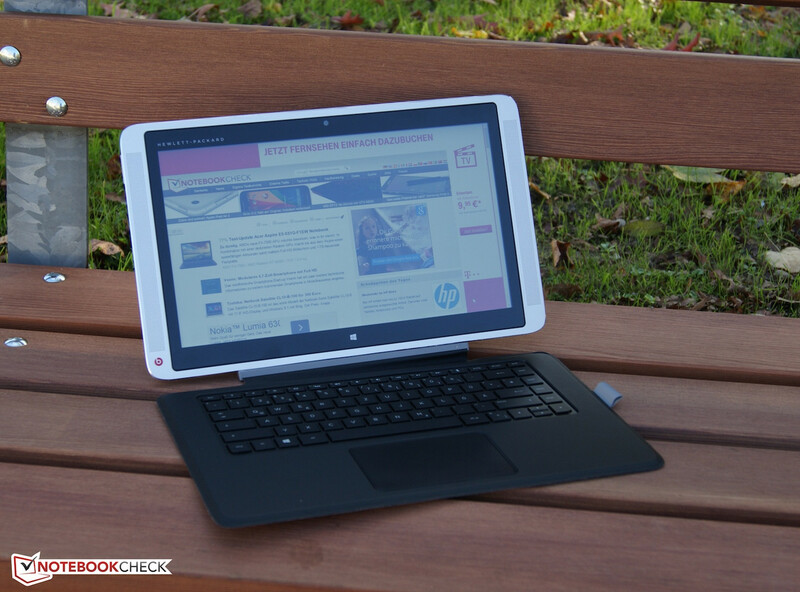 In review: HP Envy x2-j001ng. Test model courtesy of HP Store. 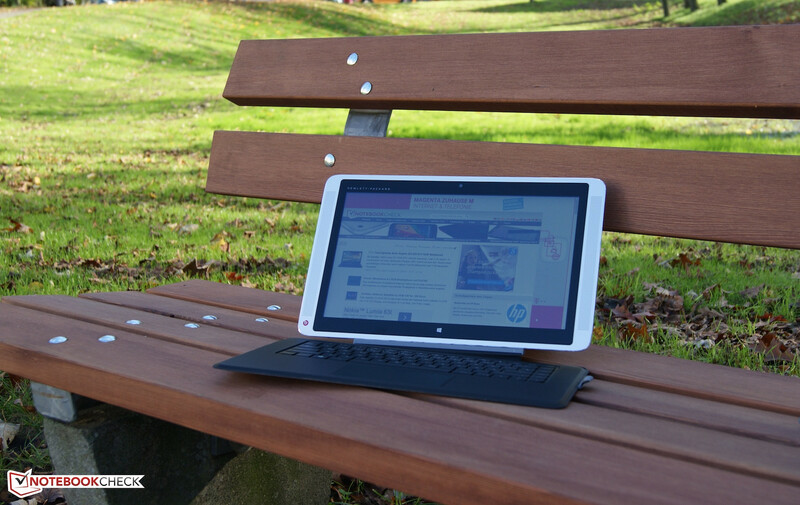 A loop for the HP Executive Tablet Pen G2. 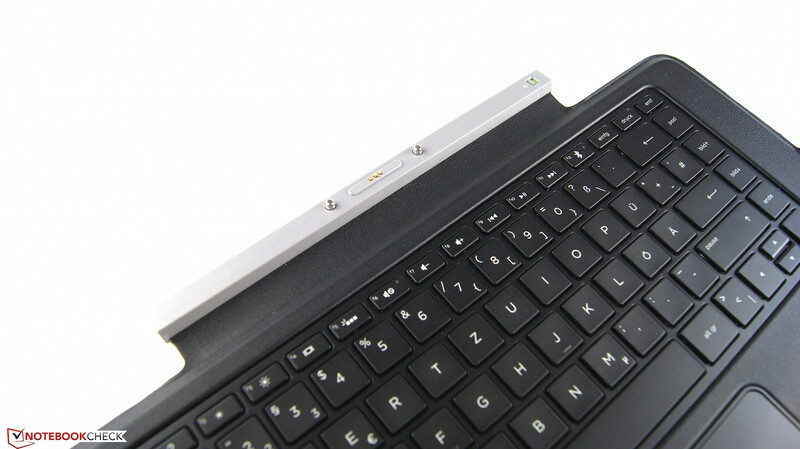 Magnetic connector for the Bluetooth keyboard. Interesting choice of materials for the keyboard's underside. High responsiveness and a great sound reproduction. A firmer mount for mobile keyboard use and a stronger battery. The convertible proved to be a real all-rounder. HP's Envy x2 joins a bevy of convertibles: Toshiba Satellite Click 2 Pro, Asus Transformer Book T300LA, Spectre 13 x2, Dell XPS 11, Lenovo Yoga, etc.